Burns are caused by a transfer of energy from a heat source to the body. The depth of the injury depends on the temperature of the burning agent and the duration of contact with it. Burns disrupt the skin, which leads to increased ﬂuid loss; infection; hypothermia; scarring; compromised immunity; and changes in function, appearance, and body image. Young children and the elderly continue to have increased morbidity and mortality when compared to other age groups with similar injuries. Inhalation injuries in addition to cutaneous burns worsen the prognosis. Superﬁcial partialthickness burns (similar to ﬁrstdegree), such as sunburn: The epidermis and possibly a portion of the dermis are destroyed. 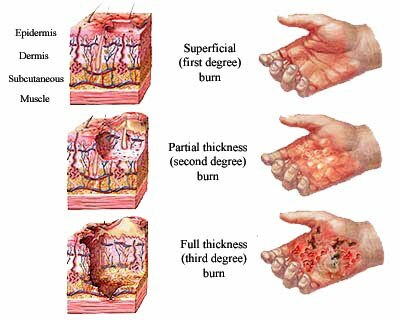 Deep partialthickness burns(similar to seconddegree), such as a scald: The epidermis and upper to deeper portions of the dermis are injured. Fullthickness burns (thirddegree), such as a burn from a ﬂame or electric current: The epidermis, entire dermis, and sometimes the underlying tissue, muscle, and bone are destroyed. 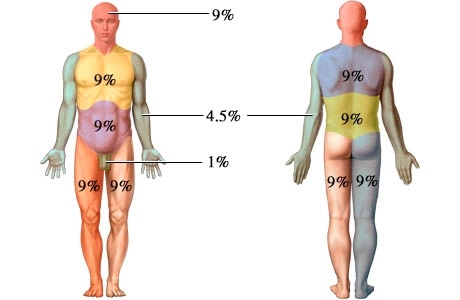 Rule of Nines: an estimation of the total body surface area burned by assigning percentages in multiples of nine to major body surfaces. Lund and Browder method: a more precise method of estimating the extent of the burn; takes into account that the percentage of the surface area represented by various anatomic parts (head and legs) changes with growth. Palm method: used to estimate percentage of scattered burns, using the size of the patient’s palm (about 1% of body surface area) to assess the extent of burn injury. Most burns result from preventable accidents. Thermal burns, which are the most common type,occur because of fires from motor vehicle crashes, accidents in residences, and arson or electrical malfunctions. Children may be burned when they play with matches or firecrackers or because of a kitchen accident. Chemical burns occur as a result of contact with, ingestion of, or inhalation of acids, alkalis, or vesicants (blistering gases). The percentage of burns actually caused by abuse is fairly small, but they are some of the most difficult to manage. Neglect or inadequate supervision of children is fairly common. Effective prevention and educational efforts such as smoke detectors, flame-retardant clothing, child-resistant cigarette lighters, and the Stop Drop and Roll program have decreased the number and severity of injuries. Preschool children account for over two-thirds of all burn fatalities. Clinicians use a special chart (Lund-Browder Chart) for children that provides a picture and a graph to account for the difference in body surface area by age. Serious burn injuries occur most commonly in males, and in particular, young adult males ages 20 to 29 years of age, followed by children under 9 years of age. Individuals older than 50 years sustain the fewest number of serious burn injuries. carelessness or risk-taking behaviors around fires. Toddlers incur electrical burns from biting electrical cords or putting objects in outlets. Most adults are victims of house fires or workrelated accidents that involve chemicals or electricity. The elderly are also prone to scald injuries because their skin tends to be extremely thin and sensitive to heat. Because of the severe impact of this injury, the very young and the very old are less able to respond to therapy and have a higher incidence of mortality. In addition, when a child Burns 167 experiences a burn, multiple surgeries are required to release contractures that occur as normal growth pulls at the scar tissue of their healed burns. Adolescents are particularly prone to psychological difficulties because of sensitivity regarding body image issues. No specific gender and ethnic/racial considerations exist in burns. Elderly people are at higher risk for burn injury because of reduced coordination, strength, and sensation and changes in vision. Predisposing factors and the health history in the older adult inﬂuence the complexity of care for the patient. Pulmonary function is limited in the older adult and therefore airway exchange, lung elasticity, and ventilation can be affected. This can be further affected by a history of smoking. Decreased cardiac function and coronary artery disease increase the risk of complications in elderly patients with burn injuries. Malnutrition and presence of diabetes mellitus orother endocrine disorders present nutritional challenges and require close monitoring. Varying degrees of orientation may present themselves on admission or through the course of care making assessment of pain and anxiety a challenge for the burn team. The skin of the elderly is thinner and less elastic, which affects the depth of injury and its ability to heal. MINOR BURN CARE. Minor burn wounds are cared for by using the principles of comfort, cleanliness, and infection control. A gentle cleansing of the wound with soap and water 2 or 3 times a day, followed with a topical agent such as silver sulfadiazine or mafenide, prevents infection. Minor burns should heal in 7 to 10 days; however, if they take longer than 14 days, excision of the wound and a small graft may be needed. Oral analgesics may be prescribed to manage discomfort, and as do all burn patients, the patient needs to receive tetanus toxoid to prevent infection. work, nutrition, psychology, and child life for children. The course of recovery is divided into four phases: emergent-resuscitative, acute-wound coverage, convalescent-rehabilitative, and reorganization-reintegration. The emergent-resuscitative phase lasts from 48 to 72 hours after injury or until diuresis takes place. In addition to managing airway, breathing, and circulation, the patient receives fluid resuscitation, maintenance of electrolytes, aggressive pain management, and early nutrition.Wounds are cleansed with chlorhexidine gluconate and care consists of silver sulfadiazine ormafenide and surgical management as needed. To prevent infection, continued care includes further débridement by washing the surface of the wounds with mild soap or aseptic solutions. Then the physician débrides devitalized tissue, and often the wound is covered with antibacterial agents such as silver sulfadiazine and occlusive cotton gauze. The acute-wound coverage phase, which varies depending on the extent of injury, lasts until the wounds have been covered, through either the normal healing process or grafting. The risk for infection is high during this phase; the physician follows wound and blood cultures and prescribes antibiotics as needed. Wound management includes excision of devitalized tissue, surgical grafting of donor skin, or placement of synthetic membranes. Inpatient rehabilitation takes place during the convalescent-rehabilitative phase. Although principles of rehabilitation are included in the plan of care from the day of admission, during this time, home exercises and wound care are taught. In addition, pressure appliances to reduce scarring, or braces to prevent contractures, are fitted. The reorganization phase is the long period of time that it may take after the injury for physical and emotional healing to take place. Focus on the major priorities of any trauma patient; the burn wound is a secondary consideration, although aseptic management of the burn wounds and invasive lines continues. Assess circumstances surrounding the injury: time of injury, mechanism of burn, whether the burn occurred in a closed space, the possibility of inhalation of noxious chemicals, and any related trauma. Monitor vital signs frequently; monitor respiratory status closely; and evaluate apical, carotid, and femoral pulses particularly in areas of circumferential burn injury to an extremity. Start cardiac monitoring if indicated (eg, history of cardiac or respiratory problems, electrical injury). Check peripheral pulses on burned extremities hourly; use Doppler as needed. Monitor ﬂuid intake (IV ﬂuids) and output (urinary catheter) and measure hourly. Note amount of urine obtained when catheter is inserted (indicates preburn renal function and ﬂuid status). Assess body temperature, body weight, history of preburn weight, allergies, tetanus immunization, past medicalsurgical problems, current illnesses, and use of medications. Arrange for patients with facial burns to be assessed for corneal injury. Continue to assess the extent of the burn; assess depth of wound, and identify areas of full and partialthickness injury. Assess neurologic status: consciousness, psychological status, pain and anxiety levels, and behavior. Assess patient’s and family’s understanding of injury and treatment. Assess patient’s support system and coping skills. Provide humidiﬁed oxygen, and monitor arterial blood gases (ABGs), pulse oximetry, and carboxyhemoglobin levels. Assess breath sounds and respiratory rate, rhythm, depth, and symmetry; monitor for hypoxia. Observe for signs of inhalation injury: blistering of lips or buccal mucosa; singed nostrils; burns of face, neck, or chest; increasing hoarseness; or soot in sputum or respiratory secretions. Report labored respirations, decreased depth of respirations, or signs of hypoxia to physician immediately; prepare to assist with intubation and escharotomies. Monitor mechanically ventilated patient closely. Institute aggressive pulmonary care measures: turning, coughing, deep breathing, periodic forceful inspiration using spirometry, and tracheal suctioning. Maintain proper positioning to promote removal of secretions and patent airway and to promote optimal chest expansion; use artiﬁcial airway as needed. Monitor vital signs and urinary output (hourly), central venous pressure (CVP), pulmonary artery pressure, and cardiac output. Note and report signs of hypovolemia or ﬂuid overload. Maintain IV lines and regular ﬂuids at appropriate rates, as prescribed. Document intake, output, and daily weight. Elevate the head of bed and burned extremities. Monitor serum electrolyte levels (eg, sodium, potassium, calcium, phosphorus, bicarbonate); recognize developing electrolyte imbalances. Notify physician immediately of decreased urine output; blood pressure; central venous, pulmonary artery, or pulmonary artery wedge pressures; or increased pulse rate. Provide warm environment: use heat shield, space blanket, heat lights, or blankets. Assess core body temperature frequently. Work quickly when wounds must be exposed to minimize heat loss from the wound. Use a pain scale to assess pain level (ie, 1 to 10); differentiate between restlessness due to pain and restlessness due to hypoxia. Administer IV opioid analgesics as prescribed, and assess response to medication; observe for respiratory depression in patient who is not mechanically ventilated. Provide emotional support, reassurance, and simple explanations about procedures. Assess patient and family understanding of burn injury, coping strategies, family dynamics, and anxiety levels. Provide individualized responses to support patient and family coping; explain all procedures in clear, simple terms. Provide pain relief, and give antianxiety medications if patient remains highly anxious and agitated after psychological interventions. respiratory status immediately to physician; and assist as needed with intubation or escharotomy. Distributive shock: Monitor for early signs of shock (decreased urine output, cardiac output, pulmonary artery pressure, pulmonary capillary wedge pressure, blood pressure, or increasing pulse) or progressive edema. Administer ﬂuid resuscitation as ordered in response to physical ﬁndings; continue monitoring ﬂuid status. Acute renal failure: Monitor and report abnormal urine output and quality, blood urea nitrogen (BUN) and creatinine levels; assess for urine hemoglobin or myoglobin; administer increased ﬂuids as prescribed. Compartment syndrome: Assess peripheral pulses hourly with Doppler; assess neurovascular status of extremities hourly (warmth, capillary refill, sensation, and movement); remove blood pressure cuff after each reading; elevate burned extremities; report any extremity pain, loss of peripheral pulses or sensation; prepare to assist with escharotomies. Paralytic ileus: Maintain nasogastric tube on low intermittent suction until bowel sounds resume; auscultate abdomen regularly for distention and bowel sounds. Curling’s ulcer: Assess gastric aspirate for blood and pH; assess stools for occult blood; administer antacids and histamine blockers (eg, ranitidine [Zantac]) as prescribed. The acute or intermediate phase begins 48 to 72 hours after the burn injury. Burn wound care and pain control are priorities at this stage. Focus on hemodynamic alterations, wound healing, pain and psychosocial responses, and early detection of complications. Measure vital signs frequently; respiratory and ﬂuid status remains highest priority. Assess peripheral pulses frequently for ﬁrst few days after the burn for restricted blood ﬂow. Closely observe hourly ﬂuid intake and urinary output, as well as blood pressure and cardiac rhythm; changes should be reported to the burn surgeon promptly. For patient with inhalation injury, regularly monitor level of consciousness, pulmonary function, and ability to ventilate; if patient is intubated and placed on a ventilator, frequent suctioning and assessment of the airway are priorities. Monitor IV and oral ﬂuid intake; use IV infusion pumps. Measure intake and output and daily weight. Report changes (eg, blood pressure, pulse rate) to physician. Provide a clean and safe environment; protect patient from sources of crosscontamination (eg, visitors, other patients, staff, equipment). Closely scrutinize wound to detect early signs of infection. Monitor culture results and white blood cell counts. Practice clean technique for wound care procedures and aseptic technique for any invasive procedures. Use meticulous hand hygiene before and after contact with patient. Caution patient to avoid touching wounds or dressings; wash unburned areas and change linens regularly. may be increased gradually and the patient may be advanced to a normal diet or to tube feedings. Collaborate with dietitian to plan a protein and calorie-rich diet acceptable to patient. Encourage family to bring nutritious and patient’s favorite foods. Provide nutritional and vitamin and mineral supplements if prescribed. Document caloric intake. Insert feeding tube if caloric goals cannot be met by oral feeding (for continuous or bolus feedings); note residual volumes. Weigh patient daily and graph weights. Support patient during distressing and painful wound care. Coordinate complex aspects of wound care and dressing changes. Assess burn for size, color, odor, eschar, exudate, epithelial buds (small pearllike clusters of cells on the wound surface), bleeding, granulation tissue, the status of graft take, healing of the donor site, and the condition of the surrounding skin; report any signiﬁcant changes to the physician. Inform all members of the health care team of latest wound care procedures in use for the patient. Assist, instruct, support, and encourage patient and family to take part in dressing changes and wound care. Early on, assess strengths of patient and family in preparing for discharge and home care. Frequently assess pain and discomfort; administer analgesic agents and anxiolytic medications, as prescribed, before the pain becomes severe. Assess and document the patient’s response to medication and any other interventions. Teach patient relaxation techniques. Give some control over wound care and analgesia. Provide frequent reassurance. Use guided imagery and distraction to alter patient’s perceptions and responses to pain; hypnosis, music therapy, and virtual reality are also useful. Assess the patient’s sleep patterns daily; administer sedatives, if prescribed. Work quickly to complete treatments and dressing changes. Encourage patient to use analgesic medications before painful procedures. oral antipruritic agents, a cool environment, frequent lubrication of the skin with water or a silicabased lotion, exercise and splinting to prevent skin contracture, and diversional activities. Prevent complications of immobility (atelectasis, pneumonia, edema, pressure ulcers, and contractures) by deep breathing, turning, and proper repositioning. Modify interventions to meet patient’s needs. Encourage early sitting and ambulation. When legs are involved, apply elastic pressure bandages before assisting patient to upright position. Make aggressive efforts to prevent contractures and hypertrophic scarring of the wound area after wound closure for a year or more. Initiate passive and active range-of-motion exercises from admission until after grafting, within prescribed limitations. Apply splints or functional devices to extremities for contracture control; monitor for signs of vascular insufﬁciency, nerve compression, and skin breakdown. Assist patient to develop effective coping strategies: Set speciﬁc expectations for behavior, promote truthful communication to build trust, help patient practice coping strategies, and give positive reinforcement when appropriate. Demonstrate acceptance of patient. Enlist a noninvolved person for patient to vent feelings without fear of retaliation. Include patient in decisions regarding care. Encourage patient to assert individuality and preferences. Set realistic expectations for selfcare. Support and address the verbal and nonverbal concerns of the patient and family. Instruct family in ways to support patient. Make psychological or social work referrals as needed. Provide information about burn care and expected course of treatment. Initiate patient and family education during burn management. Assess and consider preferred learning styles; assess ability to grasp and cope with the information; determine barriers to learning when planning and executing teaching. Remain sensitive to the possibility of changing family dynamics. Heart failure: Assess for ﬂuid overload, decreased cardiac output, oliguria, jugular vein distention, edema, or onset of S3 or S4 heart sounds. Pulmonary edema: Assess for increasing CVP, pulmonary artery and wedge pressures, and crackles; report promptly. Position comfortably with head elevated unless contraindicated. Administer medications and oxygen as prescribed and assess response. Sepsis: Assess for increased temperature, increased pulse, widened pulse pressure, and ﬂushed, dry skin in unburned areas (early signs), and note trends in the data. Perform wound and blood cultures as prescribed. Give scheduled antibiotics on time. Acute respiratory failure and acute respiratory distress syndrome (ARDS): Monitor respiratory status for dyspnea, change in respiratory pattern, and onset of adventitious sounds. Assess for decrease in tidal volume and lung compliance in patients on mechanical ventilation. The hallmark of onset of ARDS is hypoxemia on 100% oxygen, decreased lung compliance, and signiﬁcant shunting; notify physician of deteriorating respiratory status. Visceral damage (from electrical burns): Monitor electrocardiogram (ECG) and report dysrhythmias; pay attention to pain related to deep muscle ischemia and report. Early detection may minimize severity of this complication. Fasciotomies may be necessary to relieve swelling and ischemia in the muscles and fascia; monitor patient for excessive blood loss and hypovolemia after fasciotomy. Rehabilitation should begin immediately after the burn has occurred. Wound healing, psychosocial support, and restoring maximum functional activity remain priorities. Maintaining ﬂuid and electrolyte balance and improving nutrition status continue to be important. In early assessment, obtain information about patient’s educational level, occupation, leisure activities, cultural background, religion, and family interactions. Assess selfconcept, mental status, emotional response to the injury and hospitalization, level of intellectual functioning, previous hospitalizations, response to pain and pain relief measures, and sleep pattern. Perform ongoing assessments relative to rehabilitation goals, including range of motion of affected joints, functional abilities in ADLs, early signs of skin breakdown from splints or positioning devices, evidence of neuropathies (neurologic damage), activity tolerance, and quality or condition of healing skin. Document participation and selfcare abilities in ambulation, eating, wound cleaning, and applying pressure wraps. Maintain comprehensive and continuous assessment for early detection of complications, with speciﬁc assessments as needed for speciﬁc treatments, such as postoperative assessment of patient undergoing primary excision. Goals include increased participation in ADLs; increased understanding of the injury, treatment, and planned followup care; adaptation and adjustment to alterations in body image, selfconcept, and lifestyle; and absence of complications. Schedule care to allow periods of uninterrupted sleep. Administer hypnotic agents, as prescribed, to promote sleep. Communicate plan of care to family and other caregivers. Reduce metabolic stress by relieving pain, preventing chilling or fever, and promoting integrity of all body systems to help conserve energy. Monitor fatigue, pain, and fever to determine amount of activity to be encouraged daily. Incorporate physical therapy exercises to prevent muscular atrophy and maintain mobility required for daily activities. Support positive outlook, and increase tolerance for activity by scheduling diversion activities in periods of increasing duration. Take time to listen to patient’s concerns and provide realistic support; refer patient to a support group to develop coping strategies to deal with losses. Assess patient’s psychosocial reactions; provide support and develop a plan to help the patient handle feelings. Promote a healthy body image and selfconcept by helping patient practice responses to people who stare or ask about the injury. Support patient through small gestures such as providing a birthday cake, combing patient’s hair before visitors, and sharing information on cosmetic resources to enhance appearance. Teach patient ways to direct attention away from a disﬁgured body to the self within. Coordinate communications of consultants, such as psychologists, social workers, vocational counselors, and teachers, during rehabilitation. Contractures: Provide early and aggressive physical and occupational therapy; support patient if surgery is needed to achieve full range of motion. Obtain psychological or psychiatric referral as soon as evidence of major coping problems appears. Throughout the phases of burn care, make efforts to prepare patient and family for the care they will perform at home. Instruct them about measures and procedures. Provide verbal and written instructions about wound care, prevention of complications, pain management, and nutrition. Inform and review with patient speciﬁc exercises and use of elastic pressure garments and splints; provide written instructions. Teach patient and family to recognize abnormal signs and report them to the physician. Assist the patient and family in planning for the patient’s continued care by identifying and acquiring supplies and equipment that are needed at home. Encourage and support followup wound care. Refer patient with inadequate support system to home care resources for assistance with wound care and exercises. Evaluate patient status periodically for modiﬁcation of home care instructions and/or planning for reconstructive surgery. Maintain position of function as evidenced by absence of contractures. Maintain or increase strength and function of affected and/or compensatory body part. Verbalize and demonstrate willingness to participate in activities. Demonstrate techniques/behaviors that enable resumption of activities. Maintain proper body alignment with supports or splints, especially for burns over joints. Rationale: Promotes functional positioning of extremities and prevents contractures, which are more likely over joints. Note circulation, motion, and sensation of digits frequently. Rationale: Edema may compromise circulation to extremities, potentiating tissue necrosis and development of contractures. Initiate the rehabilitative phase on admission. Rationale: It is easier to enlist participation when patient is aware of the possibilities that exist for recovery. Perform ROM exercises consistently, initially passive, then active. Rationale: Prevents progressively tightening scar tissue and contractures; enhances maintenance of muscle and joint functioning and reduces loss of calcium from the bone. Medicate for pain before activity or exercise. Rationale: Reduces muscle and tissue stiffness and tension, enabling patient to be more active and facilitating participation. Schedule treatments and care activities to provide periods of uninterrupted rest. Rationale: Increases patient’s strength and tolerance for activity. Encourage family/SO support and assistance with ROM exercises. Rationale: Enables family/SO to be active in patient care and provides more consistent therapy. Incorporate ADLs with physical therapy, hydrotherapy, and nursing care. Rationale: Combining activities produces improved results by enhancing effects of each. Encourage patient participation in all activities as individually able. Rationale: Promotes independence, enhances self-esteem, and facilitates recovery process. Rationale:Promotes independence, enhances self-esteem, and facilitates recovery process. Verbalize understanding of condition, prognosis, and potential complications. Review condition, prognosis, and future expectations. Rationale: Provides knowledge base from which patient can make informed choices. Discuss patient’s expectations of returning home, to work, and to normal activities. Rationale: Patient frequently has a difficult and prolonged adjustment after discharge. Problems often occur (sleep disturbances, nightmares, reliving the accident, difficulty with resumption of social interactions, intimacy and sexual activity, emotional lability) that interfere with successful adjustment to resuming normal life. Review and have patient/SO demonstrate proper burn, skin-graft, and wound care techniques. Identify appropriate sources for outpatient care and supplies. Rationale: Promotes competent self-care after discharge, enhancing independence. Discuss skin care. Teach proper use of moisturizers, sunscreens, and anti-itching medications. Rationale: Itching, blistering, and sensitivity of healing wounds or graft sites can be expected for an extended time, and injury can occur because of the fragility of the new tissue. Explain scarring process and necessity for and proper use of pressure garments when used. Rationale: Promotes optimal regrowth of skin, minimizing development of hypertrophic scarring and contractures and facilitating healing process. Note: Consistent use of the pressure garment over a long period can reduce the need for reconstructive surgery to release contractures and remove scars. Encourage continuation of prescribed exercise program and scheduled rest periods. Rationale: Maintains mobility, reduces complications, and prevents fatigue, facilitating recovery process. Identify specific limitations of activity as individually appropriate. Rationale: Imposed restrictions depend on severity and location of injury and stage of healing. Emphasize importance of sustained intake of high-protein and high-calorie meals and snacks. Rationale: Optimal nutrition enhances tissue regeneration and general feeling of well-being. Note: Patient often needs to increase caloric intake to meet calorie and protein needs for healing. Review medications, including purpose, dosage, route, and expected and/or reportable side effects. Rationale: Reiteration allows opportunity for patient to ask questions and be sure understanding is accurate. Advise patient and/or SO of potential for exhaustion, boredom, emotional lability, adjustment problems. Provide information about possibility of discussion with appropriate professional counselors. Rationale: Provides perspective to some of the problems patient and/or SO may encounter, and aids awareness that assistance is available when necessary. Identify signs and symptoms requiring medical evaluation: inflammation, increase or changes in wound drainage, fever/chills; changes in pain characteristics or loss of mobility and/or function. Rationale: Early detection of developing complications (infection, delayed healing) may prevent progression to more serious or life-threatening situations. Stress importance of follow-up care and rehabilitation. Rationale: Long-term support with continual reevaluation and changes in therapy is required to achieve optimal recovery. Provide phone number for contact person. Rationale: Provides easy access to treatment team to reinforce teaching, clarify misconceptions, and reduce potential for complications. Ensure patient’s immunizations are current, especially tetanus. Rationale: To prevent further injury. Identify community resources: skin or wound care professionals, crisis centers, recovery groups, mental health, Red Cross, visiting nurse, Amblicab, homemaker service. Rationale: Facilitates transition to home, provides assistance with meeting individual needs, and supports independence. Incorporate changes into self-concept without negating self-esteem. Talk with family/SO about situation, changes that have occurred. Develop realistic goals/plans for the future. Assess meaning of loss or change to patient and SO, including future expectations and impact of cultural or religious beliefs. Rationale: Traumatic episode results in sudden, unanticipated changes, creating feelings of grief over actual or perceived losses. This necessitates support to work through to optimal resolution. Acknowledge and accept expression of feelings of frustration, dependency, anger, grief, and hostility. Note withdrawn behavior and use of denial. Rationale: Acceptance of these feelings as a normal response to what has occurred facilitates resolution. It is not helpful or possible to push patient before ready to deal with situation. Denial may be prolonged and be an adaptive mechanism because patient is not ready to cope with personal problems. Set limits on maladaptive behavior. Maintain nonjudgmental attitude while giving care, and help patient identify positive behaviors that will aid in recovery. Rationale: Patient and SO tend to deal with this crisis in the same way in which they have dealt with problems in the past. Staff may find it difficult and frustrating to handle behavior that is disrupting and not helpful to recuperation but should realize that the behavior is usually directed toward the situation and not the caregiver. Be realistic and positive during treatments, in health teaching, and in setting goals within limitations. Rationale: Enhances trust and rapport between patient and nurse. Encourage patient and SO to view wounds and assist with care as appropriate. Rationale: Promotes acceptance of reality of injury and of change in body and image of self as different. Provide hope within parameters of individual situation; do not give false reassurance. Rationale:Promotes positive attitude and provides opportunity to set goals and plan for future based on reality. Assist patient to identify extent of actual change in appearance and body function. Rationale: Helps begin process of looking to the future and how life will be different. Give positive reinforcement of progress and encourage endeavors toward attainment of rehabilitation goals. Rationale: Words of encouragement can support development of positive coping behaviors. Show pictures or videos of burn care and/or other patient outcomes, being selective in what is shown as appropriate to the individual situation. Encourage discussion of feelings about what patient has seen. Rationale: Allows patient and SO to be realistic in expectations. Also assists in demonstration of importance of and/or necessity for certain devices and procedures. Encourage family interaction with each other and with rehabilitation team. Provide support group for SO. Give information about how SO can be helpful to patient. Rationale: Promotes ventilation of feelings and allows for more helpful responses to patient. Role-play social situations of concern to patient. Rationale: Prepares patient and SO for reactions of others and anticipates ways to deal with them. Refer to physical and occupational therapy, vocational counselor, psychiatric counseling, clinical specialist psychiatric nurse, social services, and psychologist, as needed. Rationale: Helpful in identifying ways/devices to regain and maintain independence. Patient may need further assistance to resolve persistent emotional problems. Provide referral to reconstructive surgeon for the patient disfigured by burns. Rationale: Reconstructive surgery can help patient gain self-esteem and confidence. Rationale: Reinforcing teaching can help patient achieve self-care. Verbalize awareness of feelings and healthy ways to deal with them. Report anxiety/fear reduced to manageable level. Demonstrate problem-solving skills, effective use of resources. Give frequent explanations and information about care procedures. Repeat information as needed. Rationale: Knowing what to expect usually reduces fear and anxiety, clarifies misconceptions, and promotes cooperation. Because of the shock of the initial trauma, many people do not recall information provided during that time. Demonstrate willingness to listen and talk to patient when free of painful procedures. Rationale: Helps patient and SO know that support is available and that healthcare provider is interested in the person, not just care of the burn. Involve patient and SO in decision making process whenever possible. Provide time for questioning and repetition of proposed treatments. Rationale: Promotes sense of control and cooperation, decreasing feelings of helplessness or hopelessness. Assess mental status, including mood and affect, comprehension of events, and content of thoughts. Rationale: Initially, patient may use denial and repression to reduce and filter information that might be overwhelming. Some patients display calm manner and alert mental status, representing a dissociation from reality, which is also a protective mechanism. Investigate changes in mentation and presence of hypervigilance, hallucinations, sleep disturbances, nightmares, agitation, apathy, disorientation, and labile affect, all of which may vary from moment to moment. Rationale: Indicators of extreme anxiety and delirium state in which patient is literally fighting for life. Although cause can be psychologically based, pathological life-threatening causes must be ruled out. Provide constant and consistent orientation. Rationale: Helps patient stay in touch with surroundings and reality. Encourage patient to talk about the burn circumstances when ready. Rationale: Patient may need to tell the story of what happened over and over to make some sense out of a terrifying situation. Adjustment to the impact of the trauma, grief over losses and disfigurement can easily lead to clinical depression, psychosis, and posttraumatic stress disorder (PTSD). Explain to patient what happened. Provide opportunity for questions and give honest answers. Rationale: Compassionate statements reflecting the reality of the situation can help patient and SO acknowledge that reality and begin to deal with what has happened. Identify previous methods of coping and handling of stressful situations. Rationale: Past successful behavior can be used to assist in dealing with the present situation. Create a restful environment, use guided imagery and relaxation exercises. Rationale: Patients experience severe anxiety associated with burn trauma and treatment. These interventions are soothing and helpful for positive outcomes. Assist the family to express their feelings of grief and guilt. Rationale: The family may initially be most concerned about patient’s dying and/or feel guilty, believing that in some way they could have prevented the incident. Be empathic and nonjudgmental in dealing with patient and family. Rationale: Family relationships are disrupted; financial, lifestyle or role changes make this a difficult time for those involved with patient, and they may react in many different ways. Encourage family/SO to visit and discuss family happenings. Remind patient of past and future events. Rationale: Maintains contact with a familiar reality, creating a sense of attachment and continuity of life. Involve entire burn team in care from admission to discharge, including social worker and psychiatric resources. Rationale: Provides a wider support system and promotes continuity of care and coordination of activities. Achieve timely healing of burned areas. Assess and document size, color, depth of wound, noting necrotic tissue and condition of surrounding skin. Rationale: Provides baseline information about need for skin grafting and possible clues about circulation in area to support graft. Provide appropriate burn care and infection control measures. Rationale: Prepares tissues for grafting and reduces risk of infection/graft failure. Rationale: Nylon fabric and/or silicon membrane containing collagenous porcine peptides that adheres to wound surface until removed or sloughed off by spontaneous skin reepithelialization. Useful for eschar-free partial-thickness burns awaiting autografts because it can remain in place 2–3 wk or longer and is permeable to topical antimicrobial agents. Rationale: Hydroactive dressing that adheres to the skin to cover small partial-thickness burns and that interacts with wound exudate to form a soft gel that facilitates debridement. Rationale: Thin, transparent, elastic, waterproof, occlusive dressing (permeable to moisture and air) that is used to cover clean partial-thickness wounds and clean donor sites. Reduces swelling/limits risk of graft separation. Elevate grafted area if possible. Maintain desired position and immobility of area when indicated. Rationale: Movement of tissue under graft can dislodge it, interfering with optimal healing. Maintain dressings over newly grafted area and/or donor site as indicated: mesh, petroleum, nonadhesive. Rationale: Areas may be covered by translucent, nonreactive surface material (between graft and outer dressing) to eliminate shearing of new epithelium and protect healing tissue. The donor site is usually covered for 4–24 hr, then bulky dressings are removed and fine mesh gauze is left in place. Rationale: Promotes circulation and prevents ischemia or necrosis and graft failure. Evaluate color of grafted and donor site(s); note presence or absence of healing. Rationale: Evaluates effectiveness of circulation and identifies developing complications. Wash sites with mild soap, rinse, and lubricate with cream several times daily after dressings are removed and healing is accomplished. Rationale: Newly grafted skin and healed donor sites require special care to maintain flexibility. Aspirate blebs under sheet grafts with sterile needle or roll with sterile swab. Rationale:Fluid-filled blebs prevent graft adherence to underlying tissue, increasing risk of graft failure. Rationale: Skin grafts obtained from living persons or cadavers are used as a temporary covering for extensive burns until person’s own skin is ready for grafting (test graft), to cover excised wounds immediately after escharotomy, or to protect granulation tissue. Rationale: Skin grafts may be carried out with animal skin for the same purposes as homografts or to cover meshed autografts. Rationale: Skin graft obtained from uninjured part of patient’s own skin and prepared in a laboratory; may be full-thickness or partial-thickness. Note: This process takes 20–30 days from harvest to application. The new CEA sheets are 1–6 cell layers thick and thus are very fragile. Rationale: Wound covering approved by the Food and Drug Administration (FDA) for full-thickness and deep partial-thickness burns. It provides a permanent, immediate covering that reproduces the skin’s normal functions and stimulates the regeneration of dermal tissue. Demonstrate nutritional intake adequate to meet metabolic needs as evidenced by stable weight/muscle-mass measurements, positive nitrogen balance, and tissue regeneration. Auscultate bowel sounds. Note hypoactive or absent bowel sounds. Rationale: Ileus is often associated with postburn period but usually subsides within 36–48 hr, at which time oral feedings can be initiated. Maintain strict calorie count. Weigh daily. Reassess percentage of open body surface area and wounds weekly. Rationale: Appropriate guides to proper caloric intake include 25 kcal/kg body weight, plus 40 kcal per percentage of TBSA burn in the adult. As burn wound heals, percentage of burned areas is reevaluated to calculate prescribed dietary formulas, and appropriate adjustments are made. Monitor muscle mass and subcutaneous fat as indicated. Rationale: Indirect calorimetry, if available, may be useful in more accurately estimating body reserves or losses and effectiveness of therapy. Provide small, frequent meals and snacks. Rationale: Helps prevent gastric distension or discomfort and may enhance intake. Encourage patient to view diet as a treatment and to make food or beverage choices high in calories and protein. Rationale: Calories and proteins are needed to maintain weight, meet metabolic needs, and promote wound healing. Ascertain food likes and dislikes. Encourage SO to bring food from home, as appropriate. Rationale: Provides patient or SO sense of control; enhances participation in care and may improve intake. Encourage patient to sit up for meals and visit with others. Rationale: Sitting helps prevent aspiration and aids in proper digestion of food. Socialization promotes relaxation and may enhance intake. Rationale: Clean mouth and clean palate enhances taste and helps promote a good appetite. Insert nasogastric tube, as indicated. Rationale: To decompress the stomach and avoid aspiration of stomach contents. Perform fingerstick glucose, urine testing as indicated. Rationale:Monitors for development of hyperglycemia related to hormonal changes or demands or use of hyperalimentation to meet caloric needs. Refer to dietitian or nutrition support team. Rationale: Useful in establishing individual nutritional needs (based on weight and body surface area of injury) and identifying appropriate routes. Provide diet high in calories or protein with trace elements and vitamin supplements. Rationale: Calories (3000–5000 per day), proteins, and vitamins are needed to meet increased metabolic needs, maintain weight, and encourage tissue regeneration. Note: Oral route is preferable once GI function returns. Insert and maintain small feeding tube for enteral feedings and supplements if needed. Rationale: Provides continuous supplemental feedings when patient is unable to consume total daily calorie requirements orally. Note: Continuous tube feeding during the night increases calorie intake without decreasing appetite and oral intake during the day. Administer parenteral nutrition solutions containing vitamins and minerals, as indicated. Rationale: Total parenteral nutrition (TPN) maintains nutritional intake and meets metabolic needs in presence of severe complications or sustained esophageal or gastric injuries that do not permit enteral feedings. Monitor laboratory studies: serum albumin, prealbumin, Cr, transferrin, urine urea nitrogen. Rationale: Indicators of nutritional needs and adequacy of diet/therapy. Rationale: Elevated serum glucose levels may develop because of stress response to injury, high caloric intake, pancreatic fatigue. Assess color, sensation, movement, peripheral pulses, and capillary refill on extremities with circumferential burns. Compare with findings of unaffected limb. Rationale: Edema formation can readily compress blood vessels, thereby impeding circulation and increasing venous stasis or edema. Comparisons with unaffected limbs aid in differentiating localized versus systemic problems (hypovolemia or decreased cardiac output). Elevate affected extremities, as appropriate. Remove jewelry or arm bands Avoid taping around a burned area. Rationale: Promotes systemic circulation and venous return that may reduce edema or other deleterious effects of constriction of edematous tissues. Prolonged elevation can impair arterial perfusion if blood pressure (BP) falls or tissue pressures rise excessively. Promotes systemic circulation and venous return that may reduce edema or other deleterious effects of constriction of edematous tissues. Prolonged elevation can impair arterial perfusion if blood pressure (BP) falls or tissue pressures rise excessively. Rationale: If BP readings must be obtained on an injured extremity, leaving the cuff in place may increase edema formation and reduce perfusion, and convert partial thickness burn to a more serious injury. Investigate reports of deep or throbbing ache, numbness. Rationale: Indicators of decreased perfusion and/or increased pressure within enclosed space, such as may occur with a circumferential burn of an extremity (compartment syndrome). Encourage active ROM exercises of unaffected body parts. Rationale: Promotes local and systemic circulation. Rationale: Cardiac dysrhythmias can occur as a result of electrolyte shifts, electrical injury, or release of myocardial depressant factor, compromising cardiac output. Maintain fluid replacement per protocol. Rationale: Maximizes circulating volume and tissue perfusion. Monitor electrolytes, especially sodium, potassium, and calcium. Administer replacement therapy as indicated. Rationale: Losses or shifts of these electrolytes affect cellular membrane potential and excitability, thereby altering myocardial conductivity, potentiating risk of dysrhythmias, and reducing cardiac output and tissue perfusion. Avoid use of IM/SC injections. Rationale: Altered tissue perfusion and edema formation impair drug absorption. Injections into potential donor sites may render them unusable because of hematoma formation. Measure intracompartmental pressures as indicated. Rationale: Ischemic myositis may develop because of decreased perfusion. Assist and prepare for escharotomy or fasciotomy, as indicated. Rationale: Enhances circulation by relieving constriction caused by rigid, nonviable tissue (eschar) or edema formation. Display relaxed facial expressions/body posture. Participate in activities and sleep/rest appropriately. Cover wounds as soon as possible unless open-air exposure burn care method required. Rationale: Temperature changes and air movement can cause great pain to exposed nerve endings. Rationale: Elevation may be required initially to reduce edema formation; thereafter, changes in position and elevation reduce discomfort and risk of joint contractures. Provide bed cradle as indicated. Rationale: Elevation of linens off wounds may help reduce pain. Wrap digits or extremities in position of function (avoiding flexed position of affected joints) using splints and foot boards as necessary. Rationale: Position of function reduces deformities or contractures and promotes comfort. Although flexed position of injured joints may feel more comfortable, it can lead to flexion contractures. Change position frequently and assist with active and passive ROM as indicated. Rationale: Movement and exercise reduce joint stiffness and muscle fatigue, but type of exercise depends on location and extent of injury. Maintain comfortable environmental temperature, provide heat lamps, heat retaining body coverings. Rationale: Temperature regulation may be lost with major burns. External heat sources may be necessary to prevent chilling. Assess reports of pain, noting location and character and intensity (0–10 scale). Rationale: Pain is nearly always present to some degree because of varying severity of tissue involvement and destruction but is usually most severe during dressing changes and debridement. Changes in location, character, intensity of pain may indicate developing complications (limb ischemia) or herald improvement and/or return of nerve function and sensation. Provide medication and/or place in hydrotherapy (as appropriate) before performing dressing changes and debridement. Rationale: Reduces severe physical and emotional distress associated with dressing changes and debridement. Encourage expression of feelings about pain. Rationale: Verbalization allows outlet for emotions and may enhance coping mechanisms. Involve patient in determining schedule for activities, treatments, drug administration. Rationale: Enhances patient’s sense of control and strengthens coping mechanisms. Explain procedures and provide frequent information as appropriate, especially during wound debridement. Rationale: Empathic support can help alleviate pain and/or promote relaxation. Knowing what to expect provides opportunity for patient to prepare self and enhances sense of control. Provide basic comfort measures: massage of uninjured areas, frequent position changes. Rationale: Promotes relaxation; reduces muscle tension and general fatigue. Encourage use of stress management techniques: progressive relaxation, deep breathing, guided imagery, and visualization. Rationale: Refocuses attention, promotes relaxation, and enhances sense of control, which may reduce pharmacological dependency. Provide diversional activities appropriate for age and condition. Rationale: Helps lessen concentration on pain experience and refocus attention. Rationale: Sleep deprivation can increase perception of pain/reduce coping abilities. Administer analgesics (narcotic and nonnarcotic) as indicated: morphine; fentanyl (Sublimaze, Ultiva); hydrocodone (Vicodin, Hycodan); oxycodone(OxyContin, Percocet). Rationale: The burned patient may require around-the-clock medication and dose titration. IV method is often used initially to maximize drug effect. Concerns of patient addiction or doubts regarding degree of pain experienced are not valid during emergent/acute phase of care, but narcotics should be decreased as soon as feasible and alternative methods for pain relief initiated. Achieve timely wound healing free of purulent exudate and be afebrile. Rationale: Dependent on type or extent of wounds and the choice of wound treatment (open versus closed), isolation may range from simple wound and/or skin to complete or reverse to reduce risk of cross contamination and exposure to multiple bacterial flora. Emphasize and model good handwashing technique for all individuals coming in contact with patient. Rationale: Prevents cross contamination; reduces risk of acquired infection. Use gowns, gloves, masks, and strict aseptic technique during direct wound care and provide sterile or freshly laundered bed linens or gowns. Rationale: Prevents exposure to infectious organisms. Monitor and/or limit visitors, if necessary. If isolation is used, explain procedure to visitors. Supervise visitor adherence to protocol as indicated. Rationale: Prevents cross-contamination from visitors. Concern for risk of infection should be balanced against patient’s need for family support and socialization. Shave or clip all hair from around burned areas to include a 1-in border (excluding eyebrows). Shave facial hair (men) and shampoo head daily. Rationale: Opportunistic infections (yeast) frequently occur because of depression of the immune system and/or proliferation of normal body flora during systemic antibiotic therapy. Examine unburned areas (such as groin, neck creases, mucous membranes) and vaginal discharge routinely. Rationale: Eyes may be swollen shut and/or become infected by drainage from surrounding burns. If lids are burned, eye covers may be needed to prevent corneal damage. Provide special care for eyes: use eye covers and tear formulas as appropriate. Rationale: Prevents adherence to surface it may be touching and encourages proper healing. Note: Ear cartilage has limited circulation and is prone to pressure necrosis. Prevent skin-to-skin surface contact (wrap each burned finger or toe separately; do not allow burned ear to touch scalp). Rationale: Identifies presence of healing (granulation tissue) and provides for early detection of burn-wound infection. Infection in a partial-thickness burn may cause conversion of burn to full-thickness injury. Note: A strong sweet, musty smell at a graft site is indicative of Pseudomonas. Examine wounds daily, note and document changes in appearance, odor, or quantity of drainage. Rationale: Indicators of sepsis (often occurs with full-thickness burn) requiring prompt evaluation and intervention. Note: Changes in sensorium, bowel habits, and respiratory rate usually precede fever and alteration of laboratory studies. Monitor vital signs for fever, increased respiratory rate and depth in association with changes in sensorium, presence of diarrhea, decreased platelet count, and hyperglycemia with glycosuria. Rationale: Water softens and aids in removal of dressings and eschar (slough layer of dead skin or tissue). Sources vary as to whether bath or shower is best. Bath has advantage of water providing support for exercising extremities but may promote cross-contamination of wounds. Showering enhances wound inspection and prevents contamination from floating debris. Remove dressings and cleanse burned areas in a hydrotherapy or whirlpool tub or in a shower stall with handheld shower head. Maintain temperature of water at 100°F (37.8°C). Wash areas with a mild cleansing agent or surgical soap. Rationale: Early excision is known to reduce scarring and risk of infection, thereby facilitating healing. Debride necrotic or loose tissue (including ruptured blisters) with scissors and forceps. Do not disturb intact blisters if they are smaller than 1–2 cm, do not interfere with joint function, and do not appear infected. Rationale: Promotes healing. Prevents autocontamination. Small, intact blisters help protect skin and increase rate of re-epithelialization unless the burn injury is the result of chemicals (in which case fluid contained in blisters may continue to cause tissue destruction). Photograph wound initially and at periodic intervals. Rationale: Provides baseline and documentation of healing process. Rationale: The following agents help control bacterial growth and prevent drying of wound, which can cause further tissue destruction. Rationale: Broad-spectrum antimicrobial that is relatively painless but has intermediate, somewhat delayed eschar penetration. May cause rash or depression of WBCs. Rationale:Antibiotic of choice with confirmed invasive burn-wound infection. Useful against Gram-negative or Gram-positive organisms. Causes burning or pain on application and for 30 min thereafter. Can cause rash, metabolic acidosis, and decreased Paco2. Rationale: Effective against Staphylococcus aureus, Escherichia coli, and Pseudomonas aeruginosa, but has poor eschar penetration, is painful, and may cause electrolyte imbalance. Dressings must be constantly saturated. Product stains skin/surfaces black. Rationale: Effective against Gram-positive organisms and is generally used for superficial and facial burns. Rationale: Broad-spectrum antimicrobial, but is painful on application, may cause metabolic acidosis or increased iodine absorption, and damage fragile tissues. Rationale: Useful for partial- and full-thickness burns; filling dead spaces, rehydrating dry wound beds, and promoting autolytic debridement. May be used when infection is present.Systemic antibiotics are given to control general infections identified by culture and sensitivity. Subeschar clysis has been found effective against pathogens in granulated tissues at the line of demarcation between viable or nonviable tissue, reducing risk of sepsis. Administer other medications as appropriate: Subeschar clysis or systemic antibiotics; Tetanus toxoid or clostridial antitoxin, as appropriate. Rationale: Tissue destruction and altered defense mechanisms increase risk of developing tetanus or gas gangrene, especially in deep burns such as those caused by electricity. Place IV and/or invasive lines in non burned area. Rationale: Decreased risk of infection at insertion site with possibility of progression to septicemia. Obtain routine cultures and sensitivities of wounds and/or drainage. Rationale: Allows early recognition and specific treatment of wound infection.